Today's theme: Mashup, for which we've selected five interviews from the summer of 2004, with co-hosts Jamis MacNiven, Al Madrigal, and W. Kamau Bell. Tyler MacNiven is a filmmaker and in this program he speaks to Jamis MacNiven and Jesse about his trek across the entirety of Japan. That journey would later be documented in Tyler's 2005 film, Kintaro Walks Japan. Following that, Jesse interviews Steve Almond. 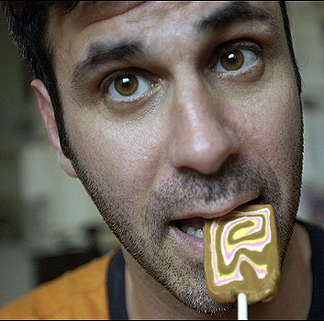 In this episode, Steve Almond discusses his candy "freakdom" chronicled in the 2004 non-fiction book, Candyfreak: A Journey through the Chocolate Underbelly of America . His most recent book is Rock and Roll Will Save Your Life: A Book by and for the Fanatics Among Us . Next, Jesse and Al Madrigal speak with Marc Horowitz. 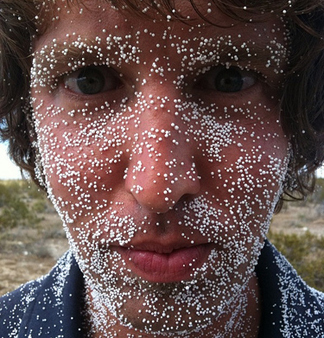 Marc Horowitz is a performance artist, actor, comic and filmmaker. He stops by to talk about a few of his performance pieces, including what happens when you mix burros with picking up the dry cleaning. You might also recognize Marc from one of his recent projects -- a piece that became a series of commercials, "Seven Days in a Sentra". You can find videos of Marc's work at his site, I Need to Stop Soon. He's also a co-host of the new TV series on G4, It's Effin' Science. And lastly, W. Kamau Bell joins Jesse to interview Tony Goldmark and Jacob Slichter. A musical comedian, Tony Goldmark has been crafting song parodies a la Weird Al since he was a kid, with a debut album when he was only 13. In this episode, he talks about his album Rage Against the Mundane . Jacob Slichter is a musician and a member of the band Semisonic. Jacob discusses his 2004 book, So You Wanna Be a Rock & Roll Star: How I Machine-Gunned a Roomful Of Record Executives and Other True Tales from a Drummer's Life . In the work, he details the often frustrating experience of dealing with the music industry.